Putting the Tea in Teacher: Should you dress your man? Should you dress your man? Since being in a proper, grown-up relationship for the last 9 months, I have been confronted with a whole list of things I never thought I would end up doing. Firstly, I didn't envisage agreeing to spend a Saturday taking his niece and nephew to the farm. I didn't expect to be thinking about moving in together. I definitely didn't imagine I'd be picking out clothes for him, when he's not even with me! I have ended up doing all these things. I feel like I need to explain myself, before you label me as a pushy girlfriend, or mother figure. My boyfriend doesn't have bad taste in clothes. In fact, apart from his beige chords (UGH! ), he dresses pretty nice. However, he doesn't have a whole lot of choice in his wardrobe, and there are things he would look good in that he doesn't own. Obviously, if he wanted to, I would leave him to his own clothes choices and let him shop of him own free will. However, he hates clothes shopping with a passion. His way of gaining a new wardrobe is to wait till Christmas comes around (and thus his birthday too, which is on Christmas Eve) and let his aunts and other family members pick out items for him. Not only is this lazy, it means he ends up wearing whatever their idea of 'young person's fashion' is. I tackled this a few months ago by nipping into H&M and grabbing him a shirt, a top, a tshirt, a pair of jeans, and then popping into Gap for some chinos. He liked everything except the top, and wears them regularly. Having succeeded in this, I have ventured to keep my eye out for clothes that would look good on him if I'm out shopping. I do partly feel like a mother-figure, and there is something a bit pushy-wife about it, but it seems to suit him and I get a real happiness when he choose to wear the stuff I got. Thankfully I know he wouldn't wear something if he didn't like it, so I don't worry that I'm forcing fashion onto him. That said, there is always a temptation to buy things I'm not sure he'll be on board with in the hopes of educating him. He always takes the mic out of my Office brogues, which I adore for work or with a pair of jeans or a skirt and socks. 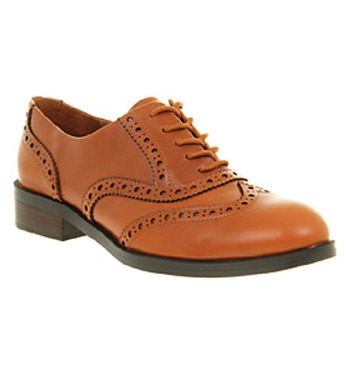 I'd love to get him a similar pair as I love brogues on men. I know he wouldn't like them, so I've held back on this. I guess I can't force him to like what I like, but I do think I'm right... brouges are hot. So am I an overbearing girlfriend or a perfect one? Let me know whether you buy your fella clothes, or whether I should back off and leave the boy in fashion purgatory in peace.